On our fifth wedding anniversary trip to Miami this past week, my husband and I discovered a number of new things. We discovered a love for Cuban food. We found that sunburns can indeed occur even under overcast skies. We came to understand the definition of “clothing-optional” beaches. And while walking the long lamplit boardwalk that runs from Miami Beach to South Beach, we discovered something else, Seagrapes. These gorgeous trees, so unremarkable to Miamians, were a revelation to us. They got me wondering about the most intriguing trees in the world. After a little digging, I found a whole grove, pardon me, a whole trove. 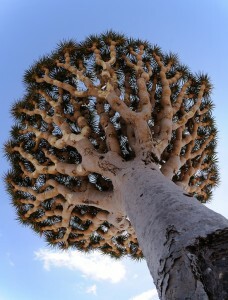 The Dracaena cinnabari, known colloquially as the Dragon Blood, is native to the Socotra archipelago in the Indian Ocean on the Gulf of Aden. 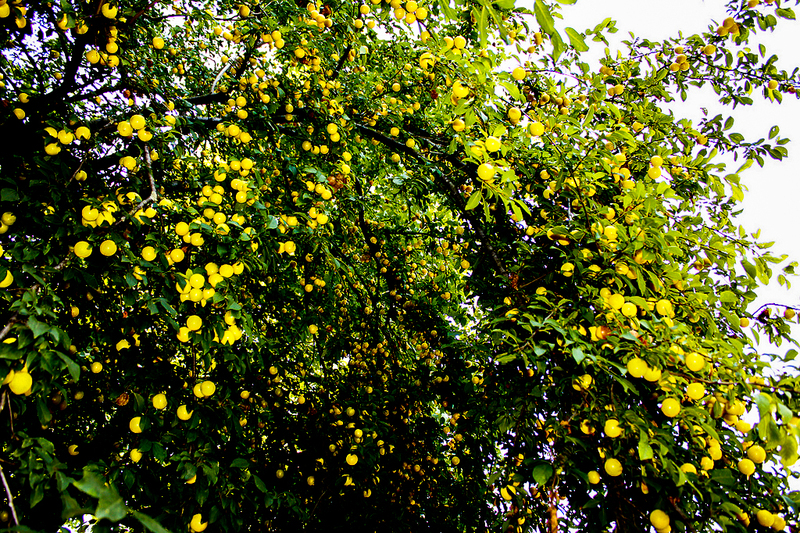 From a distance, the tree resembles a large, frilly umbrella. 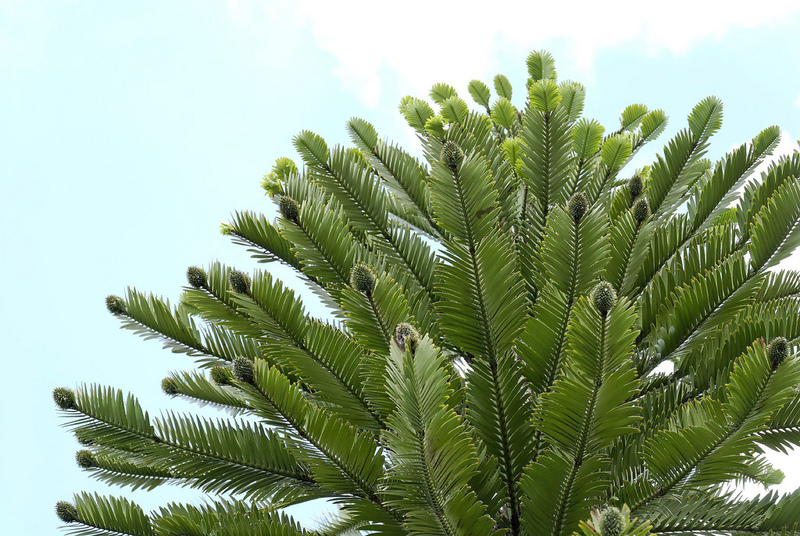 But upon closer inspection, you’ll see that the Dragon Blood treetop is a crown of spiky leaves, which can each grow up to two feet long and an inch across. Dragon Bloods can be found in Africa, Asia, and Central America. As for the tree’s somewhat gruesome nickname: It refers to the Dragon Blood’s thick red sap, which has been used through the centuries in medicine, dyes, incense, and even lipstick. The Wollemi Pine species dates back some 110 million years, so it’s incredible to think that the tree was only officially discovered in Australia in 1994. Dinosaurs may have even munched on its greens. Today, only about 100 full-grown Wollemi Pines remain, but the critically endangered trees are still a sight to behold. Shaped like an evergreen, the Wollemi can climb 130 feet in the sky and its trunk, way down at the base, can swell to three feet wide. The Wollemi’s bark is knotty and dark and its needle-like leaves fan from cone-tipped branches in feathered spirals of green. If peacocks, with their long tail feathers, had an avatar in the tree world, the Wollemi Pine might fit the bill. With its lustrous, fan-like leaves, its big bunches of yellow-green grape clusters, and its trunk that favors a tangle of ropes, the Coccoloba uvifera, or Seagrape, looks more like a plastic houseplant than an actual tree. It’s almost too good–and too enchanting–to be real. And yet the Seagrape is very real–and very common in a number of places, including South Florida, where it serves as a barrier to ocean winds and a protection for sea turtles. Where did the Seagrape get its poetic name? 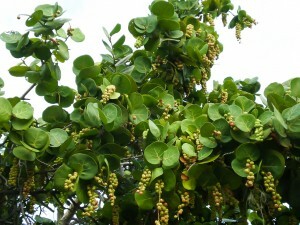 Well, the tree flourishes in coastal climes, so that’s one guess, but the name is also derived from the fruit it bears. When the eatable berries turn a deep, deep red, they have a briny taste, reminiscent of the ocean waters that crash nearby. Madagascar claims six species of baobab trees, but perhaps the most peculiar one is called Grandidier’s Baobab, after the French botanist Alfred Grandidier. What makes this endangered baobab most interesting is not the white flowers and small fruits that it produces but rather its strangely thick trunk. These trunks can grow more than nine feet thick and reach up to 100 feet tall, only to be topped by a weirdly short, flat coronet of branches and leaves. The Grandidier’s stout trunk holds tens of thousands of gallons of water, which the tree, rather like some arboreal camel, stores up for protection against drought. Self preservation at its best. 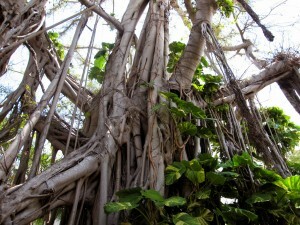 The Banyan, native to India, has an eery nickname: the strangler fig. Apparently Banyans flourish when they find a host tree to envelop with intertwining vines. With age, the Banyan’s hawser-like branches completely subsume the host, making it nearly impossible to tell the two apart. It’s hard to believe that this tree, with its guileless, teardrop-shaped leaves, could be capable of such destruction. But it goes to show you that you cannot judge a tree by its foliage. And here’s another interesting fact: Sprigs from Banyans are commonly cultivated into miniature bonsai trees. The eldest bonsai in Taiwan, come to find out, is a Banyan dating back nearly 250 years. Emily Bratcher is a contributing writer at U.S. News & World Report.